Parts list: N°1 turret with wooden posts section 9x9 cm equipped with gabled roofs bilaminate HPL and protective panels on mahogany plywood okoumé grooved phenolic-glued and no edges. Treatment with potting colored non-toxic paint and finished with wax-based water-soluble. Dim. cm 100 x 100 x 315 h. N°1 turret pool with wooden posts section. 9x9 cm equipped with protective panels in mahogany plywood okoumé grooved phenolic-glued and no edges. Treatment, the protective panels impregnated with non-toxic paint and finished with colored wax-based water-soluble. Size 100 x 100 cm x 218 h. N°1 climbing ladder with protective panels which act as a handrail made ​​of mahogany plywood okoumé grooved phenolic-glued and no edges. Treatment with potting colored non-toxic paint and finished with wax-based water-soluble. N°1 slide fiberglass h 134 cm, made with layers of high density resin. 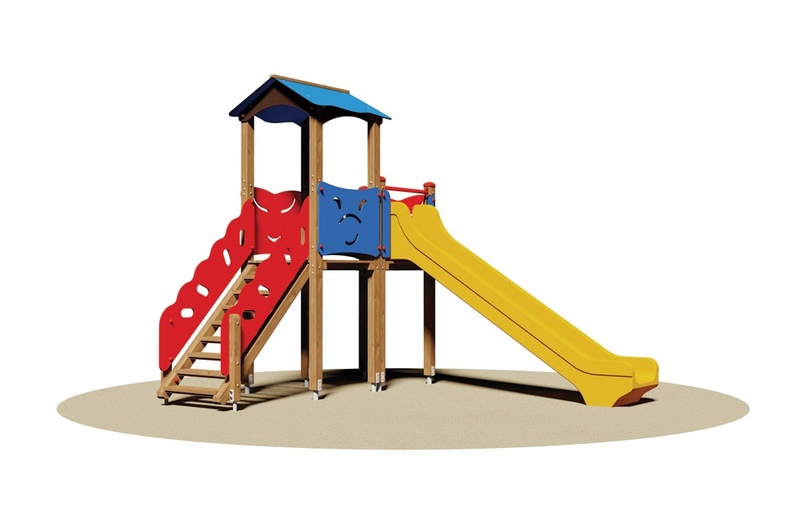 As an alternative to fiberglass slide can be mounted in a tunnel or chute opened with a polyethylene or steel track and sides made of wood. Assembled by 8.8 galvanized steel bolts and nuts. Elements covernut under colored nylon. Attacks galvanized metal for anchoring to the ground.